If your dog has consumed these foods within the past two hours (as our dog Eddie did) your vet will most likely induce vomiting via an injection (hydrogen peroxide or apomorphine) followed by activated charcoal. If your dog has eaten a significant amount, started vomiting themselves or ingested the food several hours prior, intravenous fluid therapy might be suggested. In severe cases dialysis of the blood and peritoneal dialysismight be used to support the kidneys. Hi Everyone – Are you OK? Mum tried to get me to like water when I was just a puppy, but she wasn’t successful. If the weather is hot I’m a happy race down the sand slope and lower myself into the cool water but I will forever be an “armpit Swimmer” that’s as far as I’ll go! woofs from KoKo. 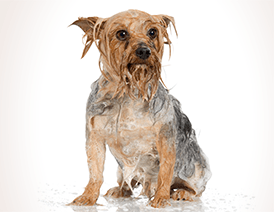 Greencross Vets’ Behaviour Services Manager Serena Dean gives us her top tips on helping pets overcome their fear of water. A bad experience may have prompted your pet’s fear of water. One bad experience, like not being able to find the steps to get out of the pool might make your pet fearful to try again. Knowing what caused your pet’s fear of water can help with the training process. Introduce or reintroduce your pet to water in a slow and positive manner, whether this is a bath, pool or the beach. Start off at a distance from the water rewarding them for calm behaviour and slowly move forward towards the water. Provide them with a small amount of water to stand in, just enough to cover their paws, like a kiddie pool or bath. If you are near a body of water teach them how to get in and out. Always start and end on a positive note, treats and games help with this. Water games can be fun for the entire family. Play games that involve water like fetch at the beach, running with them in the shallows or placing toys in a shallow kiddie’s pool. Always supervise your pet around water. Not all pets like going in the water. Never force your pet to do something they are uncomfortable with and don’t throw them into a body of water. If your pet decides they want to move away from the water, let them. Contrary to popular belief not all dogs know how to swim, we need to teach them. Start swim training in bodies of water with a gentle slope where your dog can touch the ground and slowly go out further. Keep training sessions short by going out a little further at each session and always end with a reward. Once they are comfortable submerging their body they may start to paddle. Some dogs may need a little help. Floatation vests are available so your dog can feel supported. If you’re concerned about your pet’s behaviour, speak with your Greencross Vets. One Sunday in 2014 when I was eight years of age, Mum and I walked to The Subiaco Markets as usual about 8 am. The markets are the centre of Subiaco’s social life, with stalls open Friday until Sunday. There’s always a busy and exciting atmosphere here. Over 20,000 people visit to purchase fresh fruit and socialise. Many come via the train which is healthy for the environment. We do not like car pollution in our suburb. We stroll the kilometre from our home along the curving pathways through Mueller and Kitchener Parks enjoying the crunch and crackle of the crispy red, yellow and orange leaves when I stray onto the grassy verge. I know from this sound that it’s autumn here in Western Australia, my favourite time of the year. The air today smells crisp and fresh with none of the drying heat that is summer. I detect a slight tinge of moisture but no rain is falling. When I look up I see the tree branches are bare. White fluffy clouds scatter across the blue panorama above me. I’m in my element with all my senses engaging. My paws slip in muddy patches of damp decaying leaves which then release the moist and fertile smell of the earth beneath. My human Mum says I look like a black-footed Potoroo! (That’s like a type of baby kangaroo that has sooty black paws). There is no hint during our thirty-minute promenade that an interruption will occur in our usual routine after we arrive at the Markets. Nor do we receive any atmospheric flashes to warn us that a remarkable event is about to occur and change my life forever. When we arrive at the markets my human Mum and I head to the Pappadams stall if we have a craving for a tasty Turkish Pide or delicious Dahl. On other Sundays, if we need a sugar surge, we rush straight to the French Patisserie to buy a crunchy croissant. Val, my friend who sells creamy milk and yoghurt, always lets me have a cup of milk while she minds me. My staying at Val’s stall leaves Mum free to select her veggies without me getting squashed by the many feet. After smacking my lips, I’m still wearing a white moustache on my furry lip. I bark politely “Mmmmm – more please Val?” This congenial human cannot resist my pleading deep, brown eyes. She gives in and pours me another cup of milk. I’m sitting now with a warm, contented tummy contemplating the routine of our lives. Mum returns to collect me, takes my lead and we walk together between big and little humans, prams with babies, and humans with big back packs overflowing with vegetables, towards the flower stall. I look up through the crowd and spy an unusual shape on the counter. It moves a little and I realise what it is. There among the vases of yellow wattle and native orange banksia, is the most beautiful girl dog I’ve ever seen. She is tiny and cute, and a wee bit flirtatious. With no warning, my chest feels tight; my heart beat goes into overdrive. These sensations are a new feeling for me. “What’s happening?” I wonder. “Am I having a heart attack?” This health tragedy is unlikely as I’m not in a high-risk category. Mum feeds me healthy food and only gives me small pieces of treats. We exercise daily, and of course, I don’t smoke or drink alcohol. My doggie parents are still living energetic lives. What then is this pain stabbing me deep in my chest? I let out a soft “Yip, Yip” bark to let Mum know something is wrong. She looks down at me through all the legs and can see I’m thin with concern, my ears folded back, and my eyes wide with fear. I’m pitifully anxious and trembling from my little black nose to my fluffy apricot tail. For a moment, Mum panics thinking I’m ill again. Our last trip to the animal doctor was for an emergency after I’d eaten a poisonous Blowfish at Cottesloe Beach. My life was close to fading for 24 hours. The treatment cost Mum lots of money. Her greatest fear though was not the expense, but the thought of losing me, her best mate. A dose of medicine forced me to throw up the fish. The doctor then forced black charcoal down my throat. Mum said I looked utterly miserable sitting on newspapers waiting for the medicine to work. If the situation was not so tragic she would have laughed. Luckily, I’m a resilient little dog and lived to tell you the tale. But back now to a more cheerful event that is unfolding here at the markets. Mum follows my eye-gaze upwards from human sock level to see what’s catching my attention. It doesn’t take her long to notice I’m staring at the flower stall. A grin creeps across her face, and she relaxes, as the problem becomes clear to her. “Don’t worry, Koko. Your heart is ok. I think you are feeling strange because ………… you are falling in love! We both continue to look at the flower stall counter. I hang my head as blood flows from my heart to spread warmth across my face. If I was less furry, you might have seen me blush! So, this is what love feels like, I think. What have I been missing all these years? If it’s true love is born in the most unusual places then this is it. At last, at the age of eight, I’ve met a female dog whom I may grow to love more than myself. Mum is kind and lets me stay with my new love for a while. Bella and I keep staring at each other and panting softly together. Yipping quietly we tell each other a little of our backgrounds. We reveal the usual parts of our lives that humans also talk about when starting to get to know a new companion: our ages, where we live, how we spend our days and who the humans are who care for us. Mum comes back to collect me carrying a bottle of Val’s creamy milk for our breakfasts the following week. Bella and I say our farewells with a little nose kiss and Mum and I head off back home. This time we walk down Rokeby Road, the main street of Subiaco so we can greet all the humans and dogs we know. Weekends are very social in our suburb. Of course, we stop at a café to have our coffee. We call mine a Puppicino, but in truth, it’s the milky froth off the top of Mum’s Cappuccino. I’m allowed five fingers of the bubbles “One, two, three four and “Last one””. People at the cafes laugh, they think I’m spoiled, and they’re right! The following Sunday Mum I wake Mum from her deep sleep with a tap of my paw on her shoulder. I’m anxious to get to the markets. Through bleary eyes Mum looks at the clock and says “KoKo it’s only 4 am. Please go back to sleep. I keep tapping on her shoulder, barking persistently “Woof, Woof, Mum …… let’s go to the markets, please. Let’s go to the markets NOW”. Mum convinces me to go back to sleep with a promise we will go when they open at 8 am. As soon as we arrive at the markets, I drag Mum directly to the flower stall. My collar is almost choking me, Mum can’t keep up with my desperate pace. I’m relieved to see Bella is here again, looking gorgeous. We curl our bodies together on the counter generating a warm glow in each of our hearts. Our pleasant companionship goes on in this manner every Sunday for a beautiful year. Sometimes our Mums let us go for a walk together along a few of the many laneways that bisect the Subiaco streets. We sniff Wee-Mails together and just enjoy our time as we walk slowly sharing the growing ease between us. We both look forward to our time together each weekend. our hearts are bursting with love. When the Station Street Markets close in 2015, we did not get a chance to say farewell. It shatters my heart when Mum revealed to me that I would never see my lovely Bella again. Our happy memories will sustain Bella and me in harder times. We will not forget our joyful interactions. It is best, I hear, to experience love and lose it than to have never loved at all. Having fallen in love so completely and unexpectedly, I totally agree with this sentiment. May you all find love in the world somewhere and treasure the experience when you do.